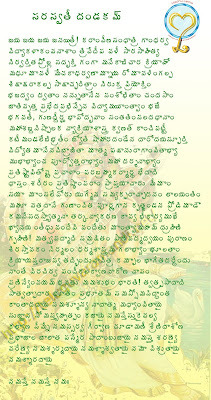 Reading Saraswati Dandakam before starting of new term of education is auspicious. The JPG of the Sarswathi dandakam is not clearly visible.This is a nice dandakam we don't get any where.Please put it in the text format. why not give it in the form of pdf ? it will help us take a print easily. please give the dandakam as a pdf with large and clear letters. It will help us a lot. I will try to put it in a .pdf pls visit again in a few days.